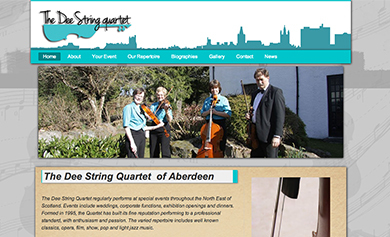 "The Dee String Quartet regularly performs at special events throughout the North East of Scotland. Events include weddings, corporate functions, exhibition openings and dinners. Formed in 1995, the Quartet has built its fine reputation performing to a professional standard, with enthusiasm and passion. The varied repertoire includes well known classics, opera, film, show, pop and light jazz music."